November | 2010 | What about this? Thanksgiving has come and gone in a flurry of cooking and activity. My jeans are noticeably resisting the call to stretch an additional half-inch and my refrigerator shelves sag with container after container of leftovers. That’s what a week’s worth of gluttony will do. Now that my folks and my kids are gone, I’m back to simpler and healthier cooking. 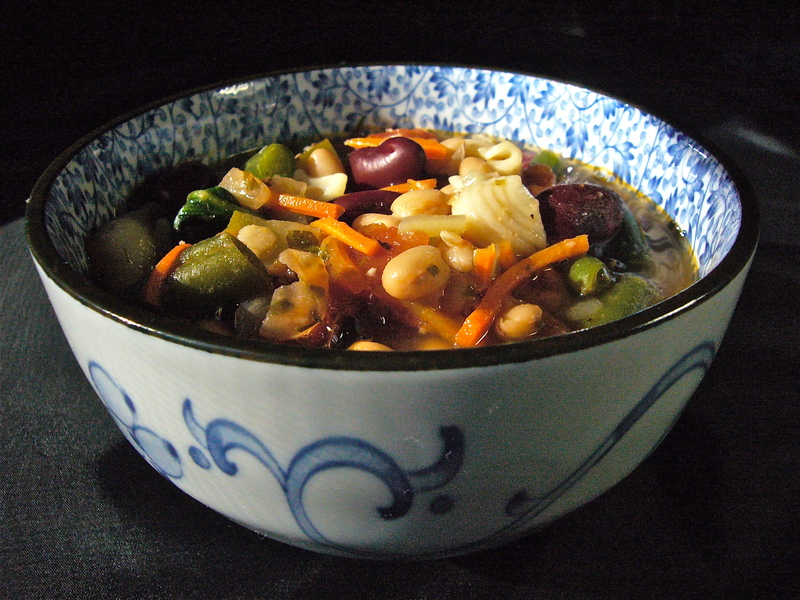 Last night I made this easy vegetarian minestrone soup – just the thing my body craved. Here’s Todd Wilbur’s, the king of copy cat recipes, version of Olive Garden’s Minestrone Soup. 1. Heat three tablespoons of olive oil over medium heat in a large soup pot. 2. Saute onion, celery, garlic, green beans, and zucchini in the oil for 5 minutes or until onions begin to turn translucent. 3. Add vegetable broth to pot, plus drained tomatoes, beans, carrot, hot water, and spices. 4. Bring soup to a boil, then reduce heat and allow to simmer for 20 minutes. 5. Add spinach leaves and pasta and cook for an additional 20 minutes or until desired consistency. 6. Makes about eight 1 1/2 cup servings. 1. I used 1 cup of diced zucchini, because I like more vegetables than normally called for and why waste half of a zucchini? 2. The green beans and spinach I put in long enough to cook through, but just before serving. I wanted them to maintain their fresh green color and not become overcooked. 3. I could not find frozen Italian green beans, so I used plain frozen cut green beans. 4. I added 1/3 cup of chopped celery instead of the 1/4 cup called for. 5. I used store bought shredded carrots. I washed them first and cut off an occasional dark end. Again, I added a little more carrots than called for. 6. Because canned broth contains a lot of sodium, I added only 1 teaspoon of salt figuring I could always add more if needed. 7. I also added 1- 8 ounce can of tomato sauce. 8. Although dried herbs are convenient, I used the fresh thyme and oregano growing in my yard. 9. If I were to make this ahead or for company, I would do everything as indicated except for the addition of the zucchini, green beans, spinach, and pasta. To maintain their color and texture, I would add the vegetables about thirty minutes before serving. To prevent the pasta from getting mushy consider precooking it al dente and then tossing it in long enough to get heated through before serving. Full of gratitude. It’s a reoccurring theme on this blog, as well as a meaningful phrase for one of my dear friends. 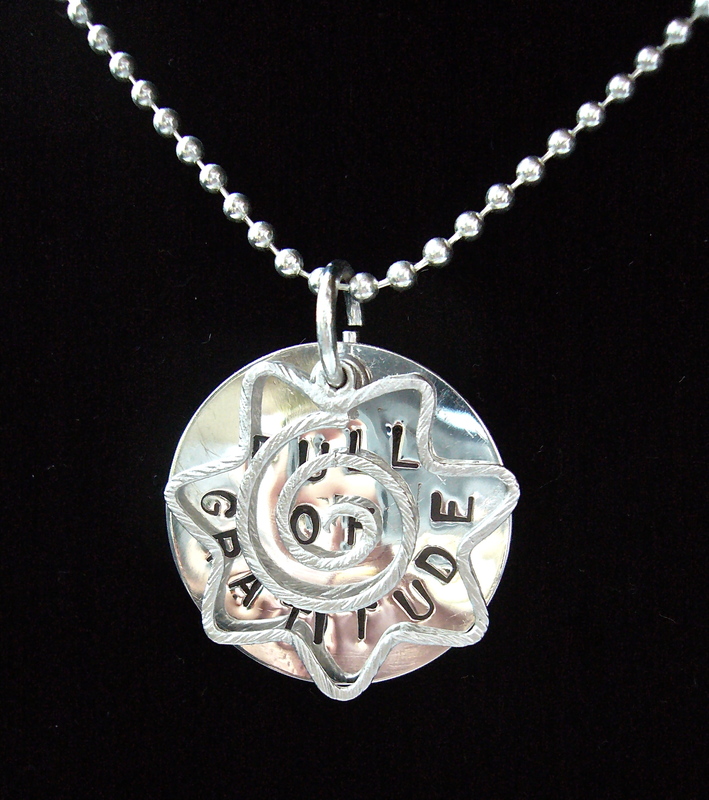 Because I am grateful to have her in my life and because she’s helped me to rekindle my “spark,” I made her this necklace. With less than one week before Thanksgiving, let’s all make the time to stop what we are doing – planning menus, working, cleaning house, chauffeuring kids, etc. – to reflect on the many things we are grateful for and to show gratitude to everyone in our lives. Although Thanksgiving is celebrated in the United States and Canada as a harvest festival, the island of Grenada and the city of Leiden in the Netherlands also celebrate a Thanksgiving Day. But why only say thanks once a year? Here are a few different ways to say thanks or thank you in other languages. You never know when this knowledge might come in handy – maybe even the next time you go out to eat!! Click here to see the entire list. When I create my cards, I enjoy cutting and manipulating pieces of paper, but here is a series of photos that takes paper art to a whole other level! It’s November and everyone is as excited as can be! Not for Thanksgiving necessarily, but for the release of the new Harry Potter film. You’ll be grateful that you know the difference between the Alohomora spell and the Finite Incantatem spell. Brush up on your knowledge with Wikipedia’s Harry Potter Spells before you see the movie! It is said that for money you can have everything, but you cannot. You can buy food, but not appetite; medicine, but not health; knowledge, but not wisdom; glitter, but not beauty; fun, but not joy; acquaintances, but not friends; servants, but not faithfulness; leisure, but not peace. You can have the husk of everything, but not the kernel. 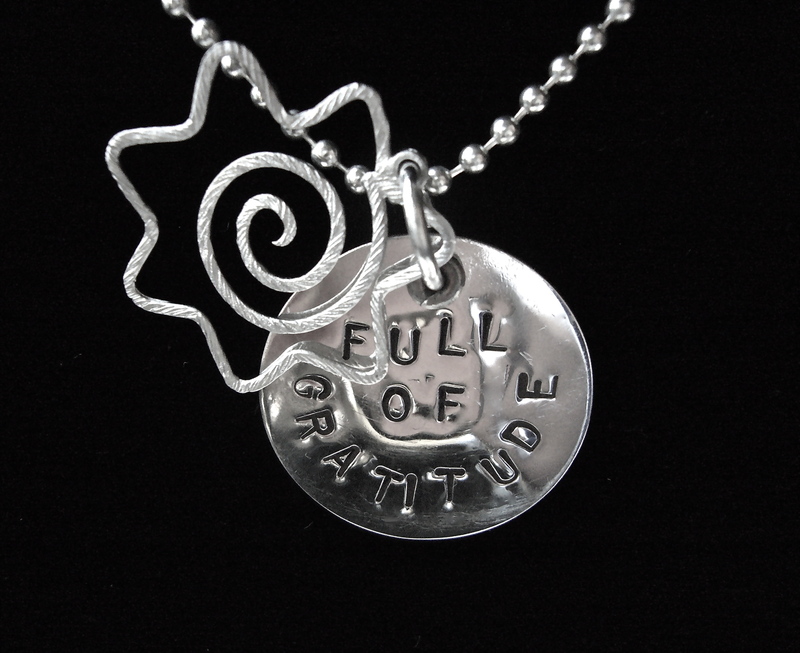 Being grateful means being appreciative – for the what, why, where, and who’s we have in life. We’ve all heard that money cannot buy happiness, but that trend of thought does not stop there. To be inspired by others check out this Marc and Angel Hack Life blog post or check out this site which allows people to post their thoughts on what money can’t buy. Be grateful you have a weekend to enjoy! Want a simple, yet elegant fall dessert recipe? Like the flavors of pumpkin pie, but don’t have the time to make and bake a pie? Don’t want to spend a lot of time in the kitchen, but want a pleasing pumpkin dessert for Thanksgiving? Want a dessert that you can pretty much make a head of time? If you answered yes to any of these questions, you need to check out this recipe! 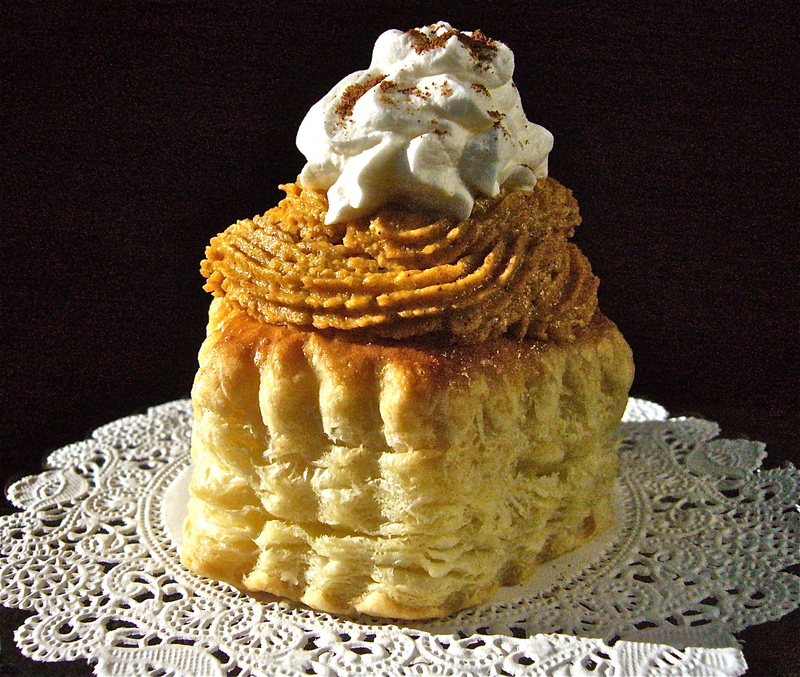 Using store bought puff pastry and canned pumpkin puree, the only hard part about this recipe is waiting the two hours it takes to chill the pumpkin mousse! 1. Bake puff pastry shells according to package directions. Cool. Remove centers. 2. Sprinkle gelatin over 1 tablespoon of water in a microwave-safe cup. Let stand 5 minutes to soften. Microwave on HIGH 10-15 seconds or just until dissolved. 3. Mix pumpkin, granulated and brown sugars, 2 tablespoons cream, cinnamon, nutmeg, salt and cloves. Heat to a boil. Remove from heat and whisk in gelatin. Cool completely. 4. Beat remaining cream in a mixing bowl until soft peaks form. Fold into pumpkin mixture. Refrigerate until mixture is set, about 2 hours. 5. Spoon pumpkin mousse into pastry shells. Serve with fresh cranberry sauce, if desired. The pumpkin mousse can be easily made ahead, but the pastry shells will taste better and have a flakier texture if baked the same day as serving. Although, you could spoon the mousse into the pastry shells, I chose to pipe it in. Instead of using a pastry bag, I used a sandwich-sized, zip-type plastic bag. By cutting less than a half-inch off one of its corners, I was able to insert a coupler and a pastry tip into that corner of the bag. After filling the bag half full with the pumpkin mousse, I piped the mousse into the shells. Instead of using fresh cranberry sauce as garnish, I whipped up a little extra whipping cream (adding a little powdered sugar while I was whipping it to sweeten the cream) and put a dollop of it on top of the mousse. I finished it off with a light sprinkle of ground cinnamon. Chopped candied ginger sprinkled on top of the cream would also be a nice finishing touch. The next time I make this I will add a little orange zest to the pumpkin mousse mixture and perhaps add a little less nutmeg. Ever wonder why Monet produced close to 250 paintings of water lilies in his garden at Giverny during the last thirty years of his life? Standing in front of a large fountain on the grounds of Mission San Juan Capistrano last weekend, I appreciated his fascination with these exotic plants as I snapped photo after photo of them. 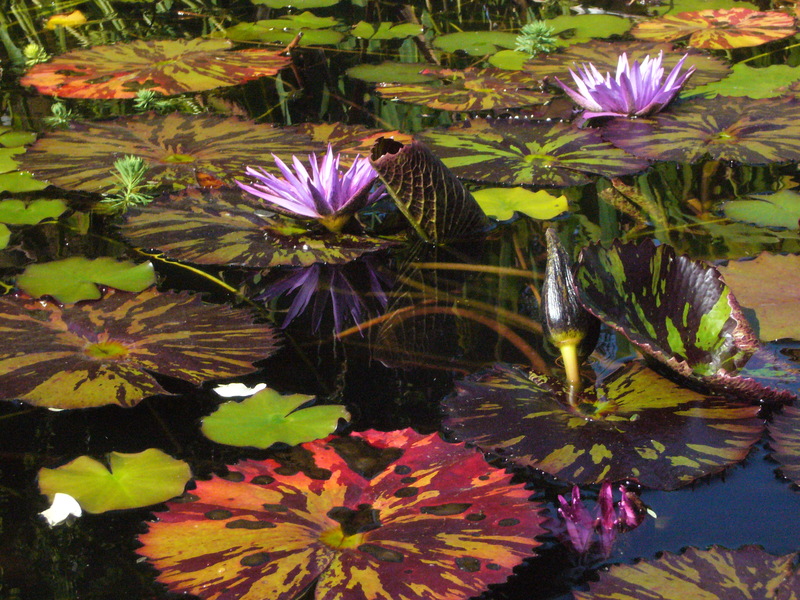 Large, colorful, variegated leaves floated peacefully on the surface of the dark, murky water, while bright spikes of blossoms opened up to the sky. There’s a Chinese proverb that says, “When you have only two pennies left in the world, buy a loaf of bread with one, and a lily with the other.” After seeing the beauty of these water lilies, I understand both the proverb and Monet much better. Want to test your knowledge about Monet? Below is a short trivia quiz I adapted from an About.com article. 1. What were Monet’s first names? 2. What school of art did Monet and his associates establish? 3. Were the artists who participated in this show known as Impressionists before the exhibition? A. No, they came up with the name afterwards, when their paintings had made a good impression on the public. B. Yes, they came up with the name specifically for the exhibition. C. Yes, Monet had been labeled an Impressionist several years before. D. No, a reviewer sarcastically entitled his article on the show the ‘Exhibition of the Impressionists’ and the name was adopted. 4. From 1890 Monet started series paintings, repeating the same scene. Why? A. He was experimenting with different materials. B. When he grew dissatisfied with a painting he would throw it away. C. He was making multiple copies to sell. D. He was preoccupied with capturing the way light looked at a particular moment. 5. What part of Monet’s garden at Giverny was his greatest source of inspiration? 6. Which of Monet’s senses failed? 7. What is the name of the Museum in Paris which houses Monet’s waterlily murals? There are many electronic devices in our households that use electricity even when they are not actively being used. According to an article that was put out by my local electricity provider, “Household electronics, including those in your bathroom, office and kitchen, can add up to about 15 percent of your home’s electricity use.” The article lists as culprits,”rechargeable battery-powered cordless phones, electric toothbrushes, computers, printers, cell phone and digital camera charges, music players, rechargeable power tools and video game and entertainment equipment. These chargers and adapters draw power whenever they are in an outlet.” Where practical, learn to unplug these devices when not in use and/or use power strips as the central turn off point for various appliances and device chargers. Books Should Be Free offers free audio books from the public domain. You can “download a free audio book in mp3, iPod, or iTunes format” in 25 different languages, including Ancient Greek! You can preview a book before you download it to verify whether or not you like the reader’s style. Many of the books have been recorded by volunteers through LibriVox, another organization offering free audio books. “LibriVox volunteers record chapters of books in the public domain and publish the audio files on the Internet. Our goal is to record all the books in the public domain.” If you have a great voice and love to read, consider volunteering to read and record one of your favorite books. If you want to feel rich, just count all the gifts you have that money cannot buy. Enjoy your beautiful autumn weekend! 1. A tall glass of 7-Up or ginger ale placed on my night stand is a must to quench my parched mouth during the night. But the most important part of this ritual is the use of a straw. When I was a kid, my mom always put a straw in my drink to make it easier to sip it during the night. Because I deem my mom as all-knowing, a straw is an essential element to my recovery. Basically, the only time straws are pulled out of the drawers in my house, is when someone is sick. 2. When my siblings and I were kids and were sick, my mom would make baked egg custard from scratch. It was the only good thing about being sick and is among my best comfort food memories. 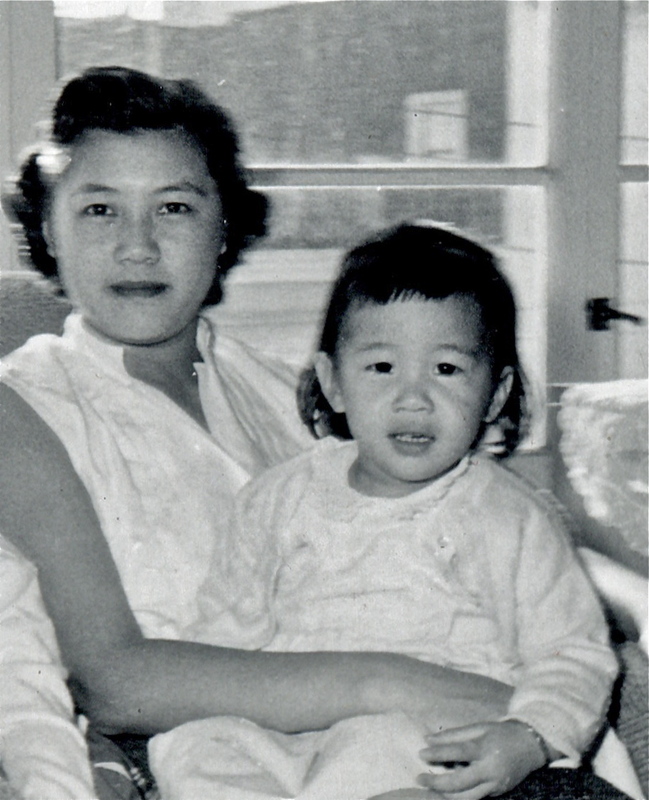 I looked forward to getting those little Pyrex custard cups filled with golden egg custard, lightly browned on the edges and sprinkled with nutmeg in the center. It was a smooth and nourishing treat that slid deliciously down my throat. Since I’m battling a nasty rhinovirus right now, I’m sending my husband out to buy milk. Nothing will make me feel better than a bowl of my mom’s baked custard. And because the cold and flu season is approaching, I’m sharing her recipe with you. Beat all ingredients, except nutmeg, together well. Pour into 4 custard cups. Sprinkle with nutmeg. Place cups into a baking pan. Pour hot water into the pan halfway up around the custard cups. The water level should be at the same level as the top of the custard. Bake at 350 degrees for about 45 minutes or until a knife inserted in the center comes out clean. Serves 4-6, depending on the size of the ramekins or custard cups. Wabi-sabi is the quintessential Japanese aesthetic. It is a beauty of things imperfect, impermanent, and incomplete. It is a beauty of things modest and humble. It is a beauty of things unconventional . . . . It is also two separate words, with related but different meanings. “Wabi” is the kind of perfect beauty that is seemingly-paradoxically caused by just the right kind of imperfection, such as an asymmetry in a ceramic bowl which reflects the handmade craftsmanship, as opposed to another bowl which is perfect, but soul-less and machine-made. “Sabi” is the kind of beauty that can come only with age, such as the patina on a very old bronze statue. Reading those words on Wiki Wiki Web soothed the ever-shrinking perfectionist in me. As I’ve grown older and wiser, I’ve come to embrace the notion that some things in life are actually better when they are not perfect. For example, rows of tiny striations marred the smooth surface of a pair of shiny, black, patent leather footwear I purchased six months ago. Noticing the striations, I became distressed. “How could this be? I’ve only worn them to work a few times! Is it too late to return these shoes? Can they be repaired?” were the thoughts making noises in my head. Knowing that the shoe manufacturer was a reputable one, I did a little online research. I happily found out that a warranty policy existed, but the manufacturer would need to inspect my footwear to determine whether or not the striations were a warranty-related issue. Emailing the manufacturer a close-up photo of the striations was a possible first step. Using my little point and shoot digital camera, I snapped several close-up shots. 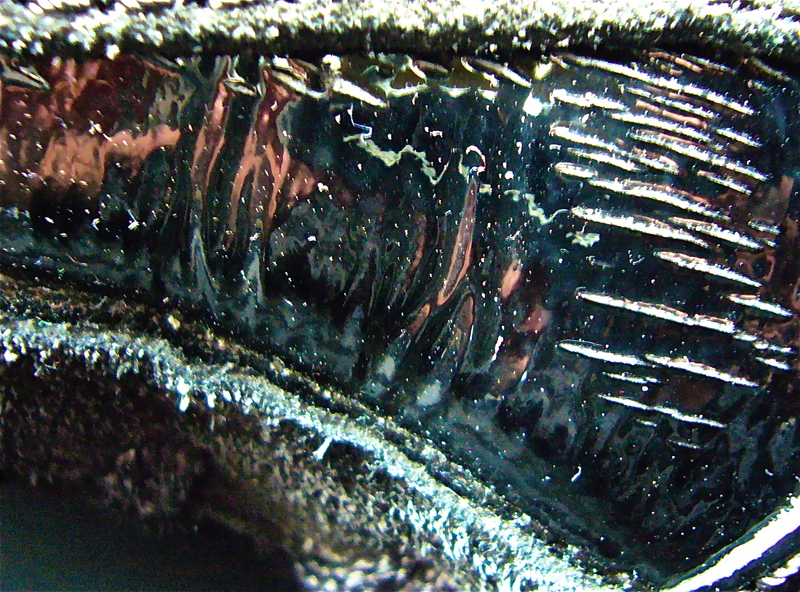 As the photos were downloading to my computer, I saw images of dark, blue-black ripples combined with rust-colored areas. Art can be found in amazing places! Upon closer examination, I liked how the dirt speckles gave the photo a feeling of texture and how the strong diagonal line created by the rough rubber sole and the horizontal line created by the suede stitching both led my eyes to the largest rust-colored image. You’ve probably guessed by now that the photo that many of you have been staring at for the last two weeks is nothing more than a close-up of the striations on my footwear and that the rust-colored areas are nothing more than the reflections of my hands holding the camera. From comments I’ve received, I’m guessing this was a challenging mystery photo. Sorry, for some reason I thought this one was going to be easier than the last! But thanks to all of you who participated in the contest and submitted guesses. Without a doubt, I think my readers have some of the most creative minds out there. But alas, there can only be one winner. So without further ado, I would like to congratulate Ella L. for winning the Birthday Contest! Your prize, a set of handmade cards, inserts, envelopes, and adhesive, will be mailed to you soon! Hope you enjoy the cards as much as I enjoyed making them! What about my footwear with the striations? Bowing to the philosophy of wabi-sabi, I respect the perfection of their imperfection and they’re still in my closet. Apples sauteed in a little olive oil, balsamic vinegar and honey. Yum! I love it when a recipe only has a few ingredients, yet delivers on flavor! Searching for something interesting and delicious to put over the pork tenderloin I had just roasted, I found this clipped recipe in one of my stacks. Apples and pork – always a great combination! Having all the ingredients on hand, I immediately started peeling and chopping. 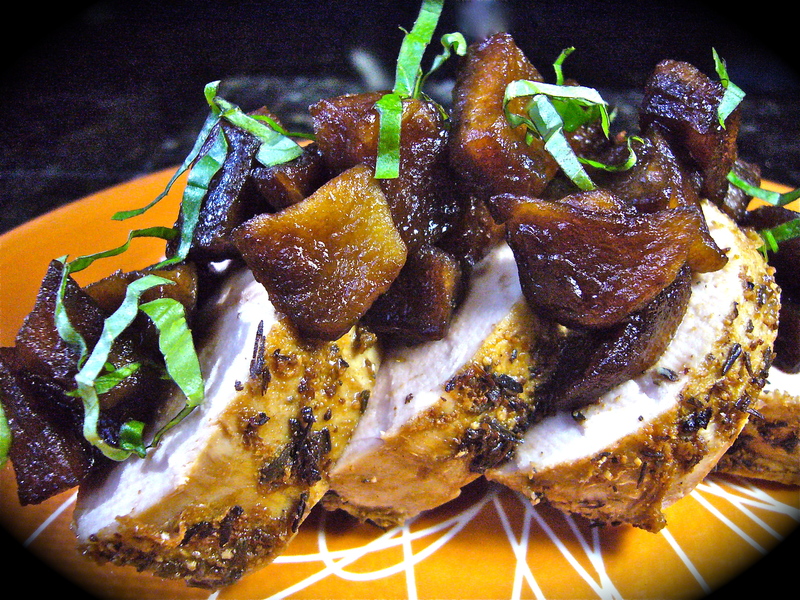 In under ten minutes, I had a delicious, sweet and tart topping for my roast pork. And don’t even think about leaving out the basil – it adds another dimension of flavor to the topping! This recipe would dress up any meal. Enjoy! 4 servings of meat of your choice: grilled or baked salmon or any roasted poultry or pork. 1. In a small nonstick skillet heat olive oil over medium heat. 2. When oil is hot, add apples and cook over medium-low heat for about 5 minutes or until softened. 3. Stir in vinegar and honey and cook for a minute or two longer. 4. Spoon topping over meat and sprinkle with sliced basil.